A pristine slice of India's 7,600 km coastline gives Karnataka - India's IT hub - more reasons to flaunt her assets, apart from her coffee and sandalwood. A plethora of gorgeous beaches are braided to Karnataka's share of 320 km long and 48 - 64 km wide coastline between the Western Ghats and the Arabian Sea, forming an exotic refuge for tourists across the nation and abroad to 'bask' their worries away. A baked sun melting into the dazzling turquiose waters, tiny yachtes and swaying palm trees silhouettes - this isn't some picture postcard extempore - the sequestered beaches of Karnataka are not just a feast to the senses but a veritable respite from the crowded beaches of Goa. Even the most visited beaches are the ones where you can draw your own space and relax. Just 6 km from the popular town Udupi is the beatific Malpe Beach famous for the exotic St Mary's Island, a boat-ride away. A 16-km drive from Bhatkal brings you to the sprawling sands of its treasure trove - the beach and the ancient temple roosted on a small hillock by the shore. This is where the West Coast Highway cruises along with the Arabian Sea on one side, and the river Sauparnika serpents against a verdant mountainous backdrop on the other. 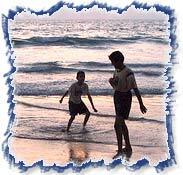 The beach forms an ideal jaunt for tourists with an ardour for adventure sports or looking for a languid vacation. A lore says that the place was sanctified by the "Panchakshetras" (Five Holy Places) of Mahabaleshwara. And the intricate stone carvings and statues about the place seems to have survived the lore. The beach is impeccable fun. Karwar, 100 km from Goa, has all the makings of a perfect holiday destination - gentle waves, palm-laced beaches, a benign sun, glistening sands, peaceful alleys - what more can you ask for? 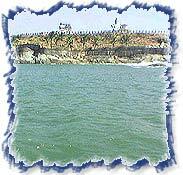 What makes the Carnatic beaches special is not just the unparalled ambience, coastal Karnataka is a stronghold of Hindu and Jain pilgrimage. Udupi (Krishna Temple and the Ashta Mathas), Dharmasthala (Jain Temples), Horanadu (Goddess Annapoorneshwari Temple), Kateel (Durga Parameshwari Temple), Gokarna (Vedic studies), Sringeri (first of Shankaracharya maths), to name a few. The Vijaynagar temple ruins are strewn in Bhatkal, Kumta, Shirali and so on. Apart from the beaches, check out their delectable cuisine like Bisi bele bath, Uppittu, Mysore masala dosa and sweet dishes such as Obbattu or Holighe served on traditional patravali (banana leaf) or muttuga (leaves stitched together). Nature enthusiasts have 22 National Parks and wildlife sanctuaris waiting to be explored. The 1600 km stretch of the Western Ghats from Maharashtra to Tamil Nadu has a major chunk (60%) in Karnataka housing the evergreen forests of Nagarahole, B.R. Hills, Male Madeshvara hills, deciduous forests of Bandipur National Park and Nugu in Karnataka, all hewn with wildlife, viz. 6000 elephants (2004 census), tigers, gaurs, endangered lion-tailed macacque, Nilgiri Langur, Great Indian Hornbills and 500 other species of birds and what not. Wildlife at Bhimeshwari, Ranganthittu Bird Sanctuary, Bhadra Wildlife Sanctuary and Kabini too attract a constant tourist bee-line for safari expeditions, angling, wildlife photography and so on. Besides, they command a majestic view of the Arabian sea devouring the vermillion sun. Check out our itineraries that has a blend of the best beaches.